Mahalo a nui loa to everyone who stopped at our table at the Made in Hawaii Festival to buy a Hawaiian Birth Signs book, audiobook, set of greeting cards or all three. Everyone who came ended up chatting and gaining plenty of insight from Kahu Silva about themselves. The best part of the experience was seeing friends whom we haven’t seen for years, making new friends, meeting two couples we married several years ago, discovering plenty of “small kine world connections” and even finding Rex – a relative I never knew I had. Many mahalos to the Hawaii Culture & Retail Assn. 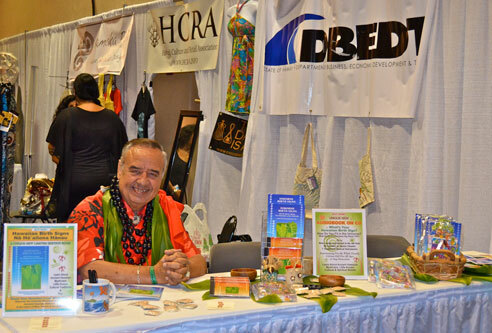 (HCRA) of which Kahu is an new advisory board member, for the opportunity to participate in the festival and to DBEDT and Hilo Hattie for their valuable support of the many talented artists who are members of HCRA.